Crow Pose (Bakasana) –This was a pose that I really wanted to nail and I would practice it on and off but never committed to nailing it fully. I am pleased to say that I can now hold it for longer than 8 seconds, I have managed 17 seconds now but I’m not able to have my arms straight which is actually fine as variations when you start off is perfectly acceptable. So I’m not that happy with the progress for this only because I haven’t really tried but happy that I’ve managed to improve on how long I hold my weight for because trust me, the pose is intense. Wheel pose (Urdhva Dhanurasana) – I did not even attempt to nail this one. I was waiting until I’d gotten crow pose down before I tried this. For me, this pose is really scary and heart openers are no joke. There was the option in two classes I’ve attended to try full wheel pose but I’ve always done the variation because the class was too big to have the teacher guide me through and I didn’t want to break my neck. I personally think this is one of the hard poses and although I’d like to be able to do it I’m not setting my sights on it this year. Warrior III (Virabhadrasana) – Ahh the only Warrior that I couldn’t do! I have mastered this and for me, it’s great because of the ankle problem I mentioned in that pose. However I didn’t achieve this last year, I only achieved it about a month ago. I finally decided to get physio for my ankle because I thought it was worth a shot to see if it improved my pain before deciding to opt for surgery. I spent 2 months with a great physio who gave me great exercises to strengthen my ankle and my calf and honestly it was so good to be doing something about it. The work we did together helped to strengthen my calf (it’s nearly the same size as my other one) but also helped me with bearing weight on my ankle. As this was one of my main issues he had one exercise dedicated to that. After time bearing weight on my ankle got easier and easier and I can now do Warrior III on both sides. The left more wobbly than the right but it’s still great. It’s not the most challenging of poses but for me personally, it’s a great triumph! So that’s it and I’m really happy with the outcomes if I’m honest. One is completed, the other is a work in progress and I’ve decided to bin the other one for the time being. Setting goals aren’t always about smashing them it’s also about learning from them and adapting them if you find that doesn’t quite suit you. I’ve decided really to move my thoughts from nailing poses to being more dedicated to yoga overall. 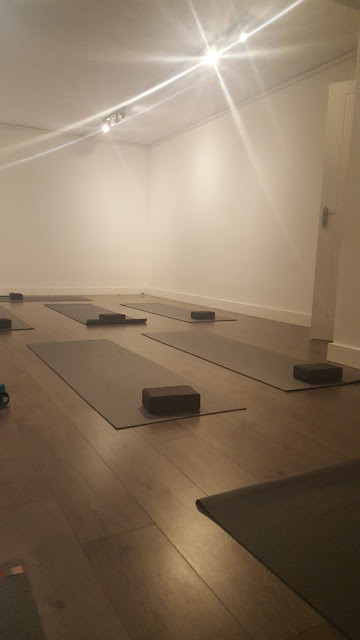 I still remember the class and doing sun salutation A and how that made me feel so connected to yoga that I was like, yes, this is what I want to do forever. Nailing poses is great because it is part of the practice but I was only wanting to do it for vanity sake and because of course, it would make for some awesome pictures! However, if I focus on the journey I’m going to love yoga more and feel more connected to my body AND be able to do those poses anyway. I’m also working out more in the gym now, focusing on cardio and doing a workout plan, so I just need to find a way to balance all of these things!